Wendy Darling has found herself once again in the arms of charming Peter Pan, the god-child who desires power above all things. This time, though, Wendy burns not with passion but with a secret: with Hook as her ally, she is there to defeat the evil that lies inside of Peter, the evil that holds all... read more Neverland hostage—the Shadow. To do this, Wendy must quietly undo Peter from inside his heart while at the same time convincing Tink to betray the twisted love that binds them together. This is a task made nearly impossible by the arrival of Booth, her sweetheart from London and a new pawn in Peter’s manipulative game—a boy whose heart she must break in order to save his life. As all of Neverland prepares to fight, Wendy races to untangle Peter’s connection to the Shadow, a secret long buried in the Forsaken Garden. When the time comes, pirates, mermaids, Lost Boys, and the Darling family will all rise—but if Wendy can’t call the Shadow, they will all be destroyed by Peter’s dark soul. War has come to paradise, and Neverland will never be the same. 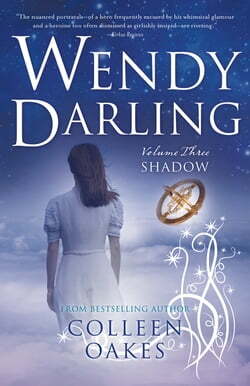 Wendy Darling: Shadow is the thrilling final installment in Colleen Oakes’s Wendy Darling Trilogy.